Dubbed “Loubi Beach,” the most spectacular show of the summer is the Christian Louboutin pop-up shop which has opened on Nammos Beach, in collaboration with the high-end boutique, Enny di Monaco. Christian Louboutin shows off in a highly instagrammable installation inspired by the island’s beach-goers, whose legs dangle off beach towels suspended high above, dressed in some of the season’s hottest styles. Lindsay Lohan’s new beach bar, called “Lohans” www.lohanmykonos.com opened on Kalo Livadi beach in May – the star has been photographed there and it looks set to the be the island’s new big thing, though whether it can quite top the excitement of what’s going on over at “Loubi’s” remains to be seen. 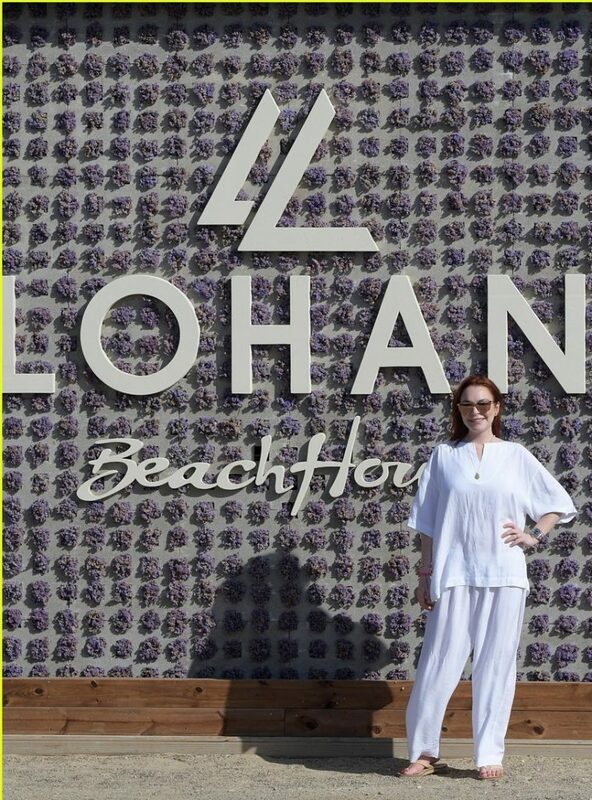 Lindsay Lohan opens her beach bar. Nammos village www.nammosvillage.com has also opened a second Louis Vuitton store, and a Nammos restaurant will shortly open in Mykonos town. Buddha Bar restaurant www.buddhabarbeachmykonos.gr has an exciting new menu. Makis , the maître d there recommends the amazing scallops with truffle sauce. Cavo Tagoo hotel www.cavotagoo.com has a great new restaurant called Ovac. It’s run by the eccentric Evripidis, who managed Spondi in Athens for the last 10 years. Lalaounis the jeweler, www.iliaslalaounis.eu won a prestigious prize at the Couture jewelry show in Las Vegas, so pop in and ask Edward, the legendary manager of the Mykonos store, to show you the latest. BA have increased flights from London and with four weekly flights from Qatar the island is rocking. That’s enough excitement for one blog – FSG is off to go discreetly crowd-stalking now….